Preaching precaution (caution employed beforehand or prudent foresight) isn’t the same as practicing it. And the ounce of prevention principle, seemingly instilled in us at birth, has long gone out the window where pesticide use is concerned. Touted as the farmer’s salvation before risks were revealed, pesticides spawned a massive and profitable industry that flourishes, like any drug dealer, by keeping its users hooked. In Europe the precautionary principle serves as a fundamental basis for generating sound public policy; public health and safety generally trumps potential threats to it. In the United States, however, dangers have to be established through what is generally termed risk analysis, meaning that ‘acceptable levels of risk’ are established. … Precaution tends to be more of an afterthought than a guiding principle in the United States, and more of a guiding light in Europe. 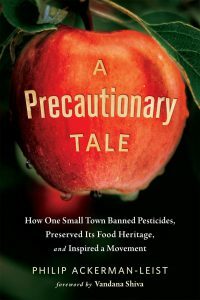 The quote comes from Philip Ackerman-Leist’s A Precautionary Tale, How One Small Town Banned Pesticides, Preserved Its Food Heritage and Inspired a Movement (Chelsea Green Publishing, White River Junction, Vermont, 2017) which tells the story of the small European village that took on and bested a corporate assault that would have spelled doom for family-scale subsistence farmers – which was pretty much everybody not growing pesticide-anointed apples. Mals is a town of 5300 inhabitants in the South Tyrol, technically in Italy’s Trentino-Alto Adige region, but with a history that aligns it with the bordering countries of Austria and Switzerland. Owing to its ruggedly mountainous terrain, this Alpine region tends to pursue its own distinct identity, so when Big Apple began to move in and take over more and more of the area’s scant farmland, there was a sense of live and let live among most of the neighbors – but a few of them initially saw reason for concern. Günther Wallnöfer, for example. He’s the first of several residents we meet during the course of this book, and he may have been the first to feel the ill effects of apple-spraying. Supporting a family on his 47-acre dairy farm would be easier if his operation were certified organic, he decided, what with the revenue increase such certification provides. He made the change in 2001; a decade later, his crop samples, which required annual testing to maintain his certification, sported pesticide residue. Wallnöfer buttonholed Ulrich Veith, the young, newly elected mayor of Mals, to complain of the problem. Veith was the right person to consult, because they shared one thing in common: a deep passion for what they both dubbed a sustainable future for Mals. This kicks off a saga that introduces the people who would launch the anti-pesticide movement, alongside historical portraits of the region. From medieval times through World War Two, it’s been an area prone to siege. Its mountains and valleys have offered natural defenses, while aiding its climate in a limited amount of specialized growing. But that climate is warming, allowing a longer growing season, bringing with it this brand-new siege. Ackerman-Leist has his own connection with area, one that goes back to 1983, when he spent a semester abroad at the Brunnenburg Castle and Agricultural Museum. This was housed in a 13th-century structure in the South Tyrol, a few miles west of Mals. Ackerman-Leist returned to the castle a few years later to work at its orchards and vineyards. While he loved the agricultural diversification of the area, by 1994 he’d had enough of spraying pesticides on crops. Back in the U.S., he developed the sustainable agriculture curriculum at Vermont’s Green Mountain College, where he continues to farm and teach. He also takes his students to Brunnenburg to study its farming practices and museum. It was while preparing for such a tour in 2014 that he learned of the upcoming Mals referendum, and he was floored: It was the first time the citizens of any town in the world had ever voted on whether to eliminate the use of all pesticides in their community. The history of apples in the valley is relatively recent; by 1945, the leaders of fruit cooperatives in the area formed its own organization to help the area growers produce their annual one million tons of apples, from a province about half the size of Connecticut with an average family orchard size of 6 to 7.5 acres. But they proved to be part of the problem. A well-established farming practice (in this case spraying pesticides to ensure a bumper crop of marketable apples) produces a strong sense of entrenchment. The author’s journey to learn the history of this revolution included visits to Urban and Annemarie Gluderer, who switched from apple growing to an organic herb farm in the valley. They had to take action when the apple-growers on three sides of their property persisted in reckless spraying, and even after spending $200,000 for a fully-enclosed greenhouse setup to protect them from the drift, their harvests were showing contamination. We also meet Edith and Robert Bernhard, who created a valuable seedbank and sought to protect that legacy; veterinarian Peter Gasser, a longtime member of a local environmental protection group who recognized the imminent pesticide peril; Franz and Pius Schuster, the fourth generation to operate the Bäkerei Schuster in the village of Laatsch, who felt the effects of climate change and pesticides on the local grain; and Johannes Unterpertinger, the pharmacist who became a spokesman for the effort, but whose outspoken manner brought personal threats and property vandalism. While the satisfying conclusion is (more or less) foregone, nonetheless efforts to fight the measure prohibiting pesticide usage continue. Most important, the trip we take through this book to get there is a fascinating study of how local activism, from people who never would have imagined themselves to be activists, can make a significant and life-bettering difference. And it finishes with advice on how to do just that in your own locality. Ackerman-Leist’s writing style has the casual, informative feel of good journalism, although his sometimes too-forced puns and wisecracks can prove distracting. But it’s more than a precautionary take: it’s an inspiring one. And it’s a story that’s not finished yet in Mals even as it begins to play out in other parts of the world. It should prove to be a valuable handbook as we all fight the necessary fight against the pesticide Goliaths.